When put up against other Bluetooth-enabled speakers in its price range, the Jabra Solemate Max is easily one of the most powerful. 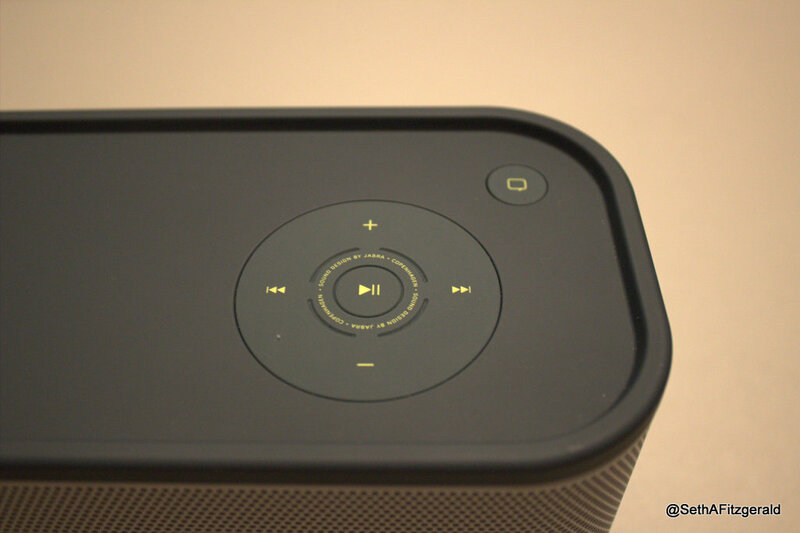 Not only does the wireless speaker boast its ability to break glass (figuratively speaking) but it also lasts for at least 10 hours on a charge, which is more than enough to use the speaker during a long get-together. There are some design flaws that I noticed relatively fast when using the Solemate Max but luckily, they are so minor that they barely impact the product as a whole. 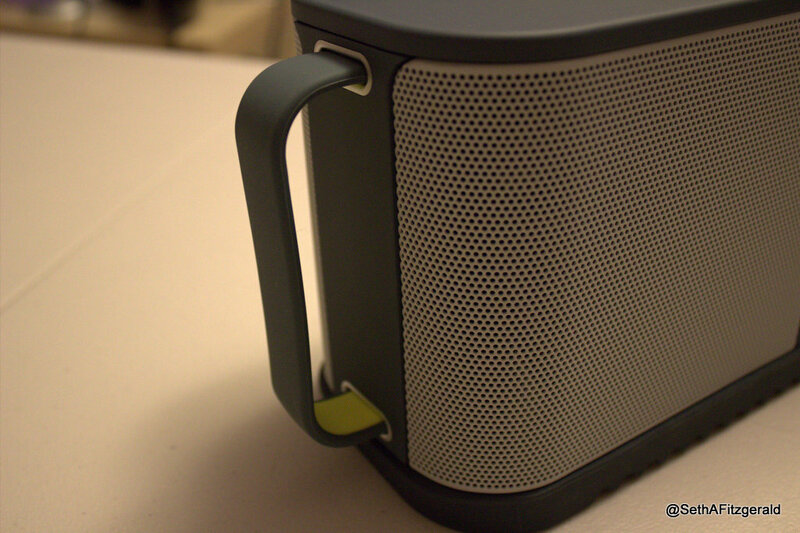 The two issues that stood out are the rubber coating on the top and bottom of the speaker, as well as the indentation that provides a resting place for the included 3.5mm audio cable. Just setting down the speaker on a carpet will allow it to pick up a lot of dust and pet hair, though it comes off just as easy as it goes on. As you can see in the included pictures, I was able to easily get off all the dust that had accumulated on the speaker. 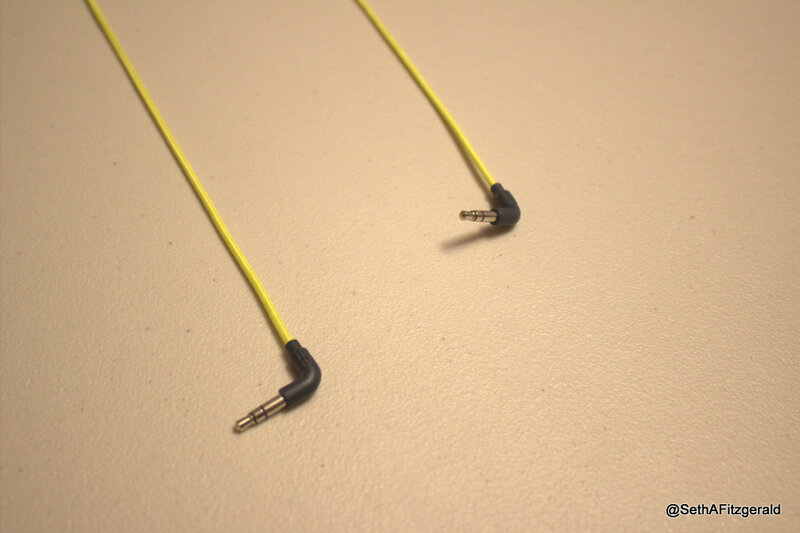 The second issue, which is centered around the spot that is supposed to hold onto the audio cable is also not a big deal, but it is worth mentioning that trying to get the cable back into the resting spot can be quite tricky. Now that we have those complaints out of the way, lets move onto the great design components of the Solemate Max. First of all, although the speaker is heavy (it may or may not be depending on your strength), it is very easy to carry around with the handle. A lot of the weight can be attributed to the materials used to make the speaker as durable as possible and unlike other “heavy-duty” products, I actually feel as though I could drop the speaker as much as I want without damaging it….But don’t try that at home. If there were one word to describe the actual audio performance that the Solemate provides, it would be LOUD. As long as you hook up the speaker to a good audio source (a desktop computer is far superior to a smartphone), the volume is almost unbearable with things only turned up to about 60-70%. That being said, even if you use a smartphone via cable or wireless, the volume is more than OK for a noisy pool party or cookout, but it is nice that you can use the Solemate for indoor music as well. Volume is definitely important but what really matters is sound quality, which is remarkably high with this speaker. There are many $400 speakers out there but for the most part, there is usually something wrong with the sound signature that they provide, yet it is hard to pinpoint a specific issue with the Solemate. Without a doubt the sound quality is not perfect but whether you like electronic music (like I do), rock, hip hop, etc, everything sounds fine for the average listener. Even audiophiles should be fine with the Solemate, especially when you consider all of the features that come along with it. Standby is rated for 400 hours and if you start to get low on battery, you can always plug it in (when possible.) What really matters, however, is that the speaker can last for an entire day, and even when it is cranked up, it can last for a long time. 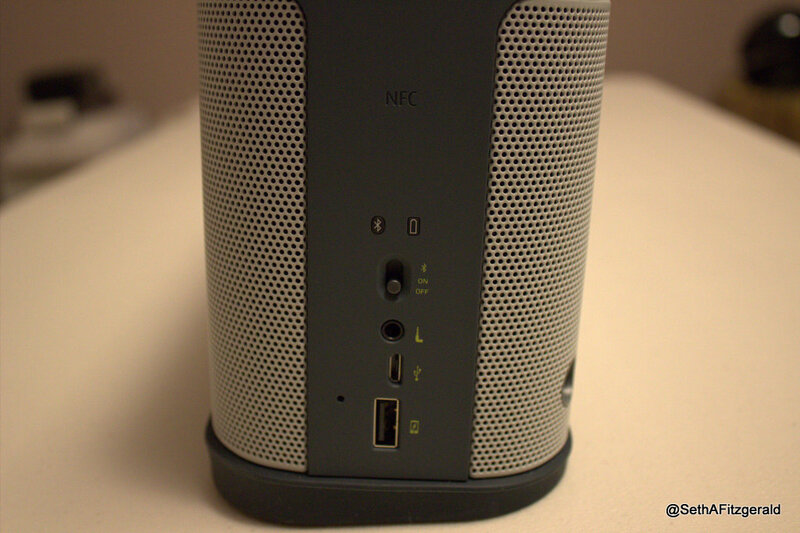 NFC and Bluetooth are both found on the device, allowing you to connect pretty much any tablet, smartphone, etc, to the speaker. Bluetooth is very common with speakers nowadays but the addition of NFC for Android phones is nice to see. 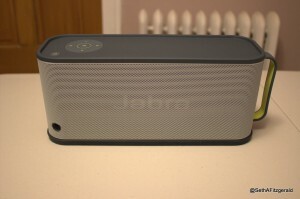 Jabra’s mobile app does add some functionality to the speaker as well, but simply connecting the Solemate Max to your music source is good enough. Spending $400 on a speaker is not something that you should do without thinking it through but based upon my testing, if you need a truly rugged speaker, the Jabra Solemate Max is about as good as it gets. If sound is the most important thing to you, the Solemate won’t necessarily let you down, but you’d be better off looking at another speaker that is not meant to be outdoors. 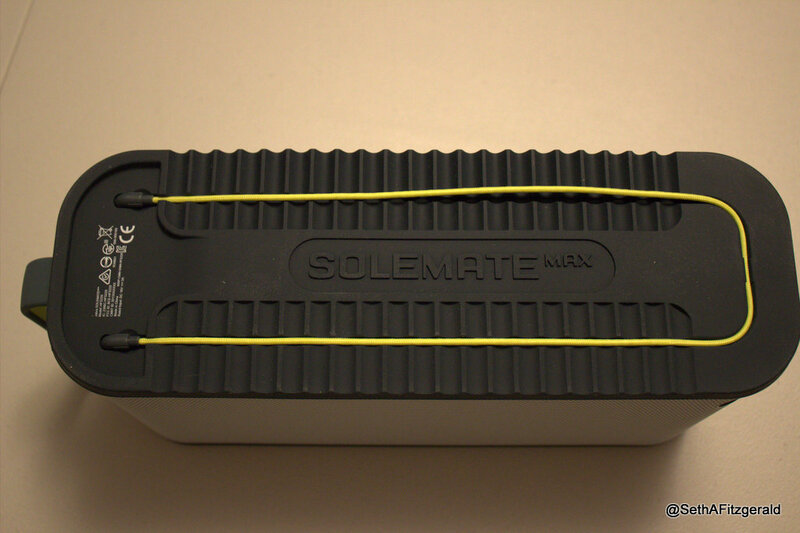 However, for people that frequently go outside and travel around, having a rugged, long-lasting, and loud speaker like the Solemate Max is beneficial.